A 21-year-old woman from Kampung Koran Bari, Serian, Sarawak has become the 5th human rabies case/fatality of 2018. The new case, confirmed on May 31, had a history of being bitten by her own dog in the right arm while trying to bathe the dog on April 20, 2018. The case had received a wound treatment and anti-tetanus injection at Serian Hospital on the night of the incident and has been advised to seek further treatment at the Clinic Dog Bite, Serian Hospital the next day. However, the case did not go to the clinic. The dog biting the case was a wild dog taken and kept by the father of the case three (3) weeks before the incident took place. The dog was also found to have never received any anti-Rabies vaccination. Since the announcement of the rabies outbreak in Sarawak beginning on July 1, 2017, the total number of rabies cases confirmed in human beings was 11 people. Of these, 10 cases have died, while one (1) case has been discharged from a hospital with severe neurological deficits and is currently being treated at home. 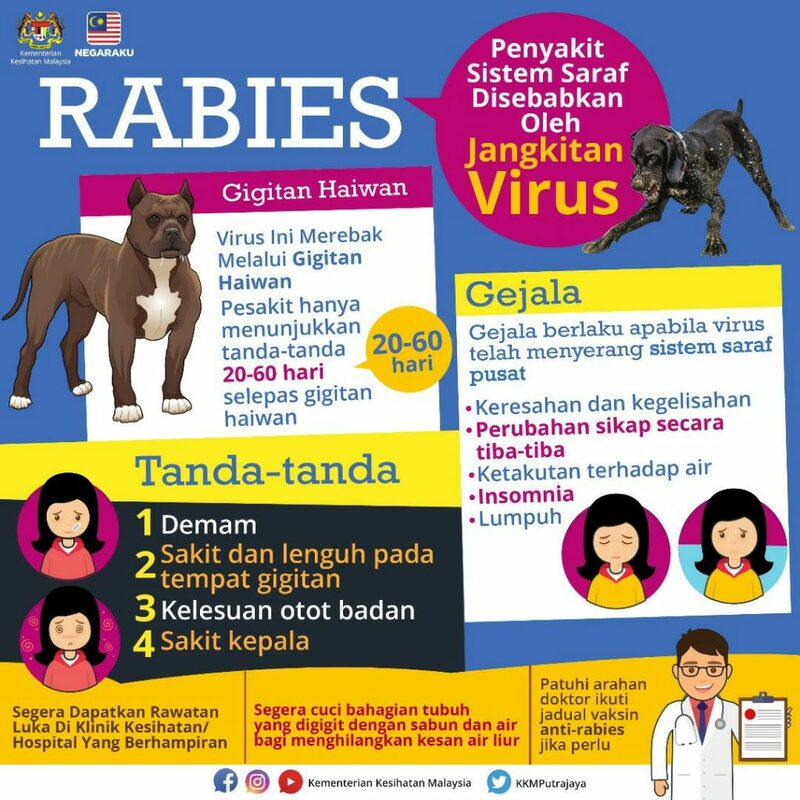 Through May 31, the State Government of Sarawak has declared 31 areas in five (5) parts in Sarawak as areas affected by rabies outbreaks. The affected areas are Serian (21 areas), Kuching (5 areas), Samarahan (3 areas) and one (1) area in Sri Aman and Sarikei. The latest positive rabies area was declared on May 28, 2018 is Kampung Selarat, Lundu District, Kuching.